Simon Good is a psychoanalytic psychotherapist and accredited supervisor registered with the British Psychoanalytic Council and the United Kingdom Council for Psychotherapy. Simon has been practicing as a psychotherapist for over twenty-five years. He currently works in private practice in Loughton and Southwark, with individuals and couples and also works as a supervisor and tutor in psychodynamic psychotherapy training at WPF Therapy. He is a supervisor for training counsellors and psychotherapists at a number of training institutions in and around London. Simon Good practices psychoanalytic psychotherapy which draws on theories and practices of analytical psychology and psychoanalysis. It is a therapeutic process which helps patients understand and resolve their problems by increasing awareness of their inner world and its influence over relationships both past and present. He has experience dealing with anxiety, depression, relationship problems, general sadness and more deep rooted issues. You do not have to be in crisis or have a mental health issue to benefit from psychological therapy sessions. These sessions offer opportunities to explore all aspects of life experience, from personal development to difficult conditions like anxiety and depression, bereavement, illness and relationship issues. Individual therapy can be once, twice or three times weekly and is open ended. Appointments take place on a mutually agreed day and time each week and last for 50 minutes. Couple therapy is the same as above but is normally once a week. Sessions are not less than once weekly for either mode of therapy. As working towards an ending is an important part of the work it is helpful to discuss this first and allow a minimum of four weeks to the end of treatment. He offers sessions face-to-face long and short term therapy that is respectful and exploratory, keeping the treatment as effective as possible. 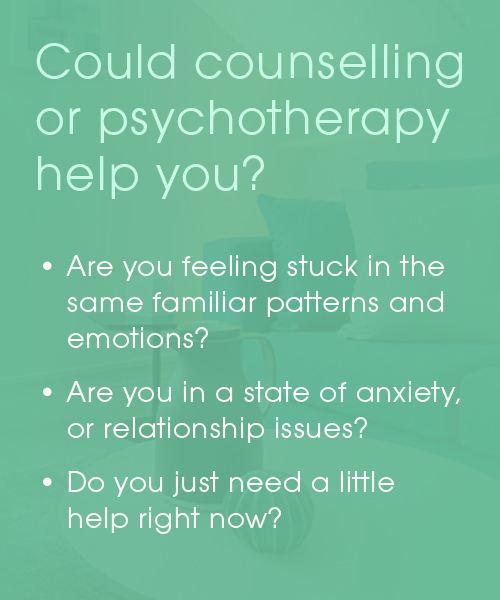 Counselling, like psychotherapy is the professional therapeutic relationship between client and counsellor. With counselling, the tenor of the relationship is more akin to student and mentor than that of doctor and patient. Counselling is conducted through the open facilitation of the counsellor. You can probably imagine how this would be relevant to, for instance, marital or relationship issues. The requirement is the therapeutic conditions of respect, empathy and congruence. You might put this as an appreciation and understanding of the other person’s point of view, and an agreement or compromise with a view to moving forward in a particular way. With this platform and with guidance from the counsellor, clients are enabled explore their own issues and to reach levels of understanding, self awareness, choices and options for their future.The requirement is the therapeutic conditions of respect, empathy and congruence. You might put this as an appreciation and understanding of the other person’s point of view, and an agreement or compromise with a view to moving forward in a particular way. With this platform and with guidance from the counsellor, clients are enabled explore their own issues and to reach levels of understanding, self awareness, choices and options for their future. Psychotherapy put simply is the healing of the mind. Just as doctors treat and heal physical ailments of the body, so psychotherapists treat and heal the mind. Though therapists work on the emotions and responses, it is also worth remembering that mental disorders may also have physical as well as emotional causes. Psychotherapy is a professional therapeutic relationship built on confidentiality and honesty. The relationship, as with normal health issues, is between the client and the therapist - the patient and the healer. The psychotherapist works within the disciplines of accepted professional practice and theory. The psychotherapist will therefore adopt explicit techniques, moving from hypothesis to treatment and solution, so the client can reach their goal of positive emotional change. Psychotherapy is deemed clinically appropriate for client's presenting with long-term, chronic unresolved issues such as trauma, depression, stress and childhood or abuse-related problems. Counselling is more suitable for particular life events such as divorce, separation, bullying, bereavement, and redundancy.Whichever route is taken, treatments will require patients’ commitment, whatever the approach, to ensure long-term benefit. An holistic approach is taken - put simply, everything is relevant. We look at all the factors that are a background or an influencer upon your current situation. For treatments to work best, we encourage honesty so that the therapist has the most accurate information possible to work with and therefore best chance of effecting a cure. The aim is to effect a long-term emotional change, not merely to treat symptoms in the short term. Confidentiality is paramount. Book therapy directly to be seen at consulting rooms in Loughton and Southwark. Fees are based on income and whether the appointment time is off peak (start time from 10am until 5pm) or peak time, (starting before 10am and from 6pm onwards and any time on Saturdays). "The therapy I received with Simon really helped me through a tough time, he was very professional and accommodating to me. " "I was given the tools to work on myself and develop my self-confidence, self-esteem and to stop my negative cycle of thoughts." For more information call 07506 228292 or send a message using the contact form below. Book a Consultation at a location that suits you. Copyright © 2018 Simon Good Therapy | Theme by SiteOrigin.